Rupert Pupkin Speaks: Vestron Video - THE WISHMASTER COLLECTION on Blu-ray ""
I was in college and working at a Video Store when the first WISHMASTER film came out in 1997. I remember it being a huge renter for us, but I never bothered to see it. You see, years of seeing tons of crappy, straight-to-video horror movies land on our shelves had soured me on taking many chances on movies that looked silly and second rate. I also didn't know who Robert Kurtzman was at the time, despite being a big fan of horror films in general. I didn't realize that he was the "K" in K.N.B. EFX - along with Greg Nicotero and Howard Berger. Had I known that, I certainly would have given the movie a look. For whatever snooty reason I might have had back then, I just never watched the movie and all these years later it had continued to elude me until this Blu-ray set. As I was watching the cast credits roll by I immediately that the film would be a good time. Robert England, Kane Hodder, Tony Todd, and Buck Flower alone were enough to get my attention. Between this fun ensemble (which also includes small parts for Ted Raimi and Reggie Bannister), a Harry Manfredini score and the amazingly gory opening set piece, I was definitely on board. The first sequence in ancient Persia that sets up the the Djinn character is still a remarkable demonstration of practical effects goodness. It's truly a calling card scene in that it features so much disgusting insanity and mayhem as to call your attention to the fact that this film was made by special makeup effects wizards. It's a scene that very much says, "hey look at what we can do!" In the best possible way. And the movie has not one but two scenes of bloody utter chaos like this and that really makes it pretty memorable. Beyond the excellent effects, WISHMASTER has another thing going for it in a great villain (especially when he's in human form) by Andrew Divoff. Divoff has the perfect malevolent face, pock-marked, but with menacing eyes that burn right through you. He's a bit over the top, but not in a way that takes away from his scariness. His smile is like the Grinch's own. In the second WISHMASTER film, he becomes a bit more quippy and starts to grow into more of a later-series Freddy Krueger type. The sequel also takes on a seemingly even more mean-spirited (and more juvenile) nature - although that is obviously a huge part of the character himself. 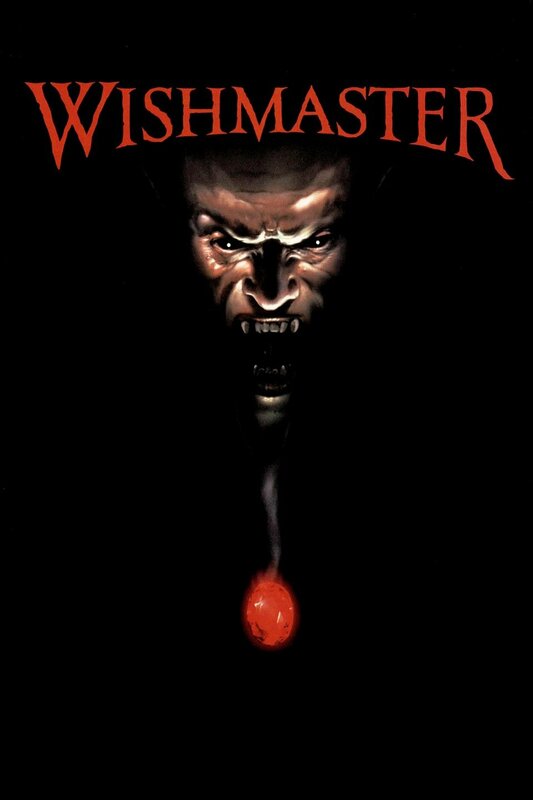 WISHMASTER 2 is directed by the underrated Jack Sholder who also brought us one of the greatest science fiction films of the 1980s in THE HIDDEN. He's also behind NIGHTMARE ON ELM STREET 2 and ALONE IN THE DARK. He's one of those directors that I always give a chance to when I run across a film of his I've yet to see. WISHMASTER 2 does make an interesting choice in that the Djinn doesn't go straight after the person who freed him, but instead gets himself thrown in prison to mix with inmates and collect fresh souls. This is a funny scenario in that he still acts like a weirdo and speaks in cryptic questions so he's not very popular with his fellow convicts. It's pretty entertaining to watch him navigate a prison movie while still being his bad-natured all-powerful self. It is quite amusing that such an almighty character can only use his magic when someone wishes him to do so. This makes for a silly but enjoyable series of attempts by the Djinn to trick people into making wishes so he can do awful stuff to them. This film even has a scene where the Djinn speaks through Tiny 'Zeus' Lister and it's pretty great. 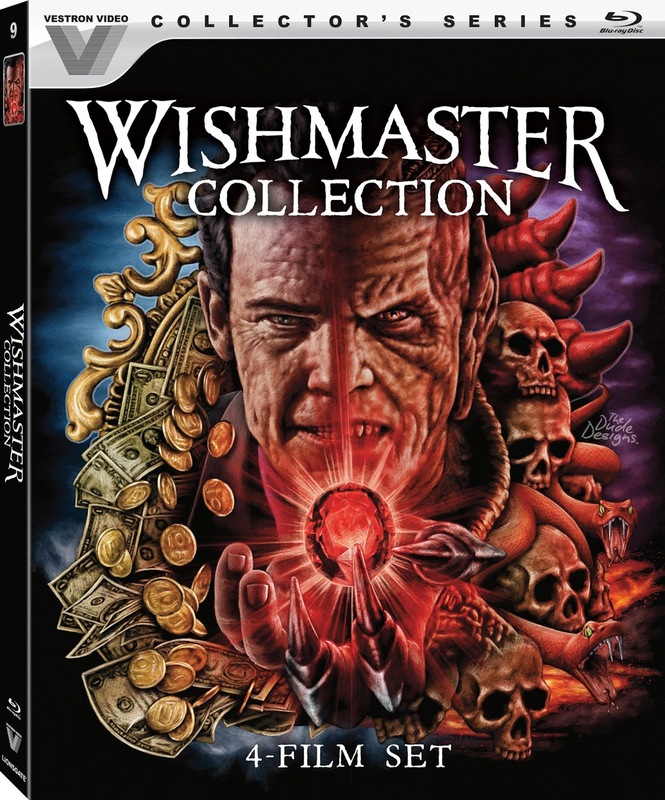 Vestron takes it one (actually two) further and also includes the third and foruth entries in the WISHMASTER series. This is a franchise overall that I wish I would have gotten into sooner, but am happy to have been able to experience via the nice Vestron Video Blu-ray set. -*NEW* Commentary with writer/director Jack Sholder for WISHMASTER 2. -*NEW* Commentary with director Chris Angel and actors Michael Trucco and Jason Thompson for WISHMASTER 3. -*NEW* Commentary with Angel and actor John Novak For WISHMASTER 4.